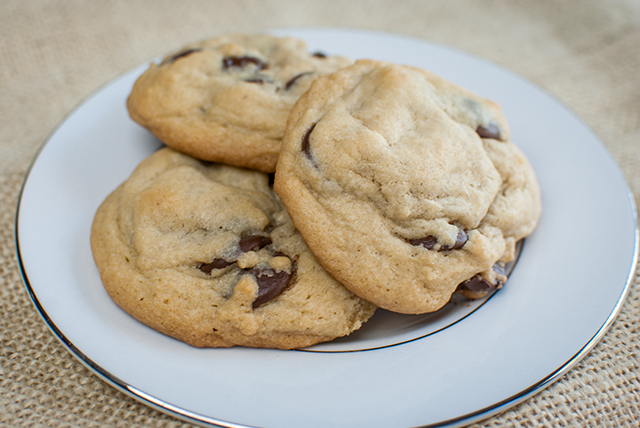 Chocolate Chip Cookies have been a staple in my childhood and adult life. 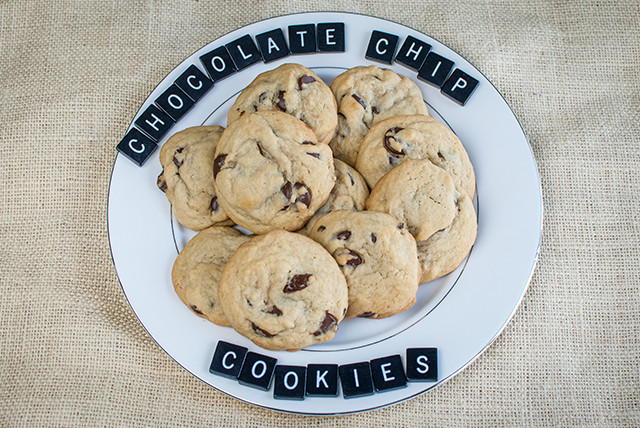 Like other moms out there I'm sure, my mom taught me how to make the best chocolate chip cookies! 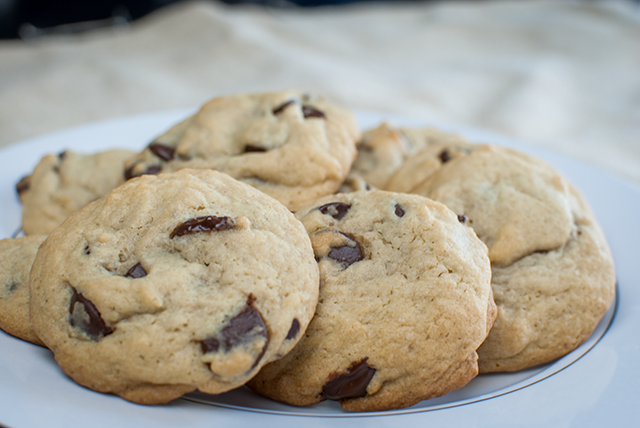 Except really, these are in fact the best classic and simple Chocolate Chip Cookies you'll ever bake and eat. I promise! 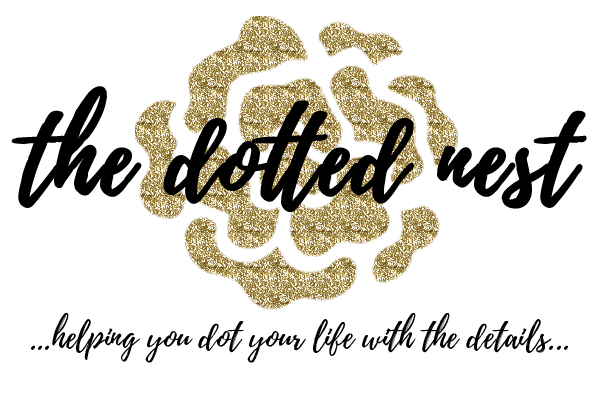 If you do a Pinterest or Google search, you will find a lot of cookie recipes. 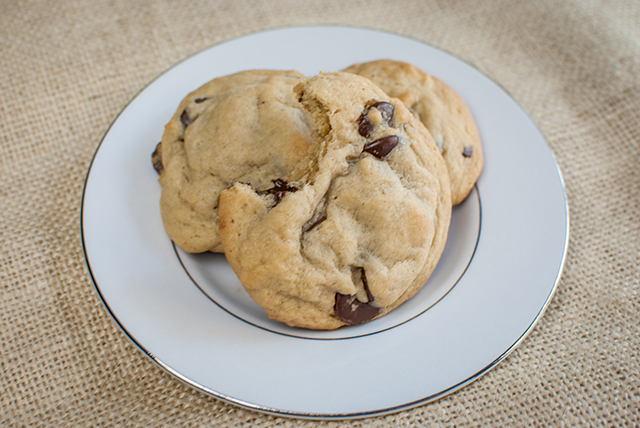 While I'm sure the hot fudge-stuffed chocolate chip cookies are delicious, and the salted caramel chocolate chip cookies look divine, sometimes you just need a classic, simple, basic Chocolate Chip Cookies recipe. 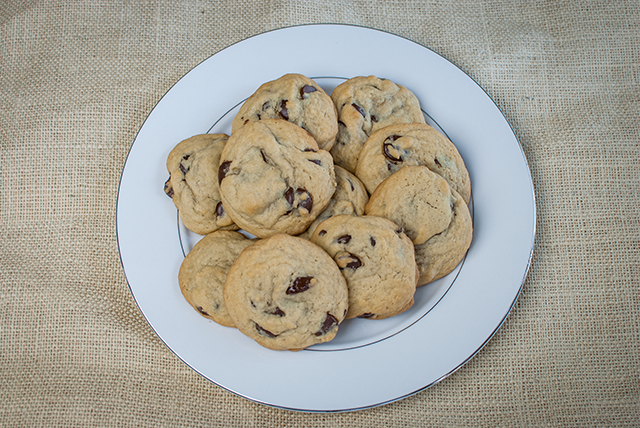 (Click here if you're looking for my Low Carb Chocolate Chip Mug Cookie recipe). I can remember standing on a chair at the kitchen sink mixing up the ingredients for the chocolate chip cookies in my mom's burnt-orange Harvest Wheat Cinderella Pyrex bowl. We didn't have a stand mixer, so it was the hand held hand mixer for us. She made me put the bowl in the sink so if there were any splatters, which there always were, they would hopefully stay in the sink and thus be an easy clean up. 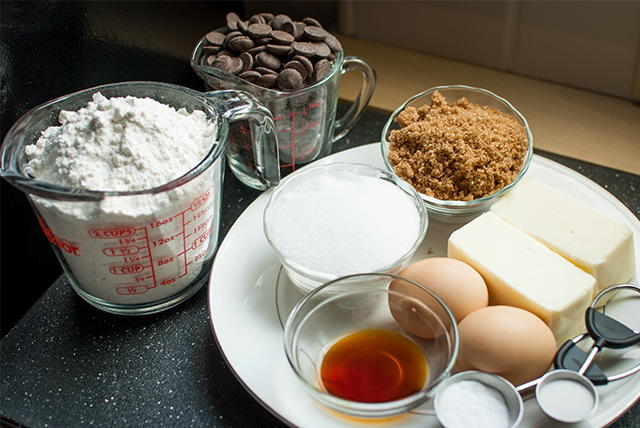 The secret to the perfect chocolate chip cookies according to my mom, is all in how you add in and mix the ingredients. First we would mix the butter until it was nice and creamy. Next the white sugar, and then the brown. In the tiny little 401 Harvest Cinderella bowl, we would crack the eggs and then beat them with the mixer before adding them to the butter and sugar mix. After the eggs were blended in we would add the vanilla, then the salt, and then the baking soda. My mom would always carefully measure out the baking soda into a small little Tablespoon size bowl, and then add hot water to it until it fizzed and bubbled up. With the baking soda mixed in, next came the flour. Very carefully we would mix in the flour, but despite my mom's careful efforts to not have her kitchen covered in flour, it almost always was by the time we were finished. She was a patient woman! When all of the flour was combined, my mom would reach in and carefully touch the dough to check the consistency, and if it needed a little more flour we would add it in. My mom truly was "the chocolate chip cookie whisperer". Ha! We might also have had a few tastes, because chocolate chip cookie dough. 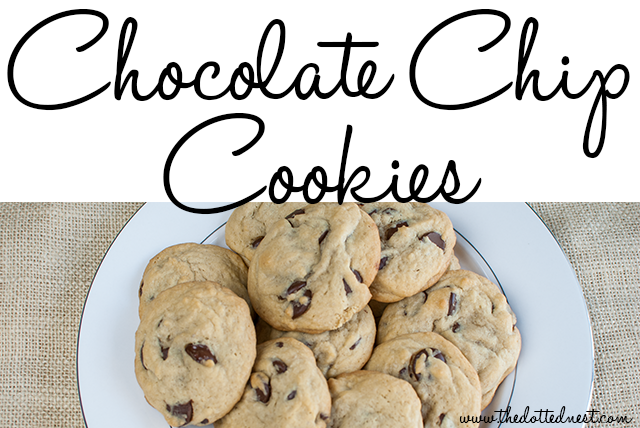 The chocolate chips came last, and we would always mix those in my hand. Sometimes we would add chopped up walnuts to the dough, but I wasn't much of a fan of the walnuts unless they were ground up in the coffee grinder. The walnuts do give it a nice flavor though! My mom passed away in July of 1998 from cancer when I was just 17 years old. There are so many memories I have of my mom, and baking chocolate chip cookies with her is definitely one of my favorites. Now that I have my own daughters I enjoy making sweet memories with them and passing on the tradition of baking chocolate chip cookies together. Whenever I need to feel close to my mom, I bake chocolate chip cookies. Mix your softened Butter, and once creamy add in the White Sugar. Add the packed Brown Sugar and mix. Crack your Eggs in a separate bowl before adding to the mix, and slowly beat them in. When the Egg is incorporated fully to the Butter and Sugar mix, add in your Vanilla, and Salt, mixing each one separately and thoroughly. Mix your 1 teaspoon of Baking Soda with 1 teaspoon of hot water. Add to the dough and blend. Slowly add in the Flour, a little bit at a time, making sure it is thoroughly blended in, and no flour dust is left on the sides of the bowl - you will need to scrape the sides of the bowl. Test your dough when you have mixed in 2.5 Cups and if it feels too sticky and not firm enough, blend in just a tiny bit more and then check the dough again. Repeat until you have the desired consistency. You do not want to over-do the flour! If you are adding in chopped Walnuts, mix them into the dough. Add your Chocolate Chips, stirring by hand is the best, but I usually just let my stand mixer do the job. 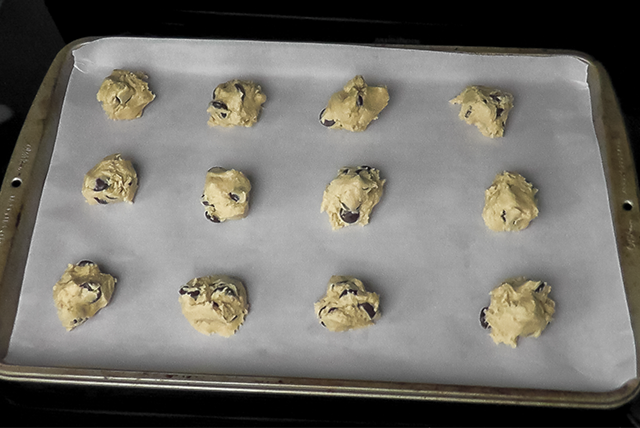 Place on a Parchment Paper lined cookie sheet, and Bake at 350* for 8.5 - 10 minutes, depending on your oven. Cool the cookies on a cooling rack until they are cool to the touch. I like to store my chocolate chip cookies in a seal-able bag or an airtight storage container. The cookies will stay fresh for about 1-4 days. In my experience they start to turn stale after day 4, but really they never last that long anyway! The recipe makes about 36 medium sized cookies. I will sometimes only bake 12 cookies at a time, and freeze the dough for later. That's it! 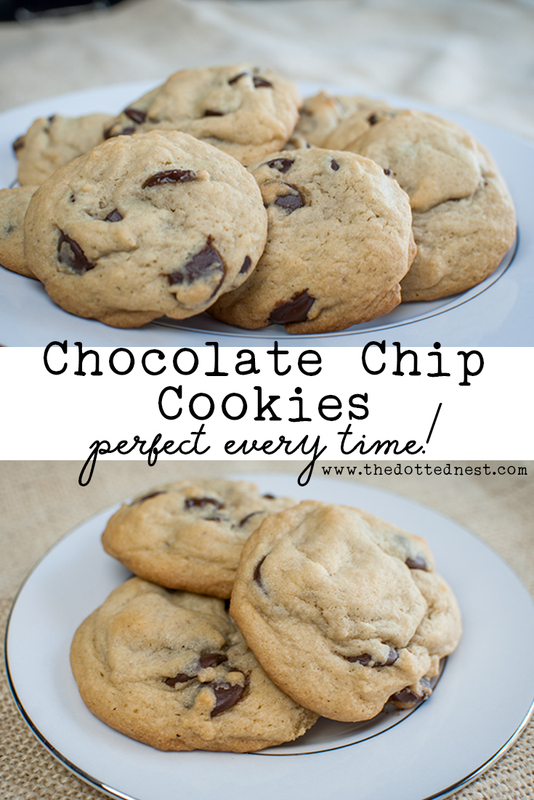 This classic Chocolate Chip Cookies recipe is really pretty simple to make, I can probably mix everything in my sleep! I hope you enjoy the cookies as much as I do and have fun making some sweet memories (and cookies!) with your kids. These look delish! I want to grab the entire plate! I have a similar recipe but with one less egg. My kid do not care for nuts in the cookies either. But you have made fun memories!! Very sweet post! It was as if we were there watching the moment between the two of you!